July 24 is celebrated as National Tequila Day. It is devoted to a popular distilled beverage made from the blue agave. Spirits called “tequila” can only be produced in Mexico. According to Mexican laws, tequila can be produced only in the state of Jalisco. The Aztec people had been making a fermented beverage from the agave plant for a long time before the Spanish arrived in Mexico. Spanish conquistadors arrived in 1521. They began to distill agave to produce an alcoholic beverage because they had ran out of brandy. Mass production of tequila began around 1600. However, the style of tequila popular today was first mass-produced in the early 1800s. Tequila was first exported to the United States in 1880s. Tequila is made with the extracted agave juice. 100% agave tequila is made with agave juice only while mixtos can use up to 49% other sugars. Tequila can either be bottled immediately after distillation or be aged. Blanca (plata) and joven (oro) tequilas are not aged. Reposado is aged a minimum of 2 months, añejo is aged a minimum of 1 year, and extra añejo is aged a minimum of 3 years. There are different ways to drink tequila. In Mexico, it is usually consumed straight. 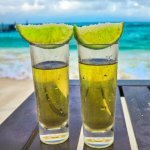 Outside Mexico, tequila shots are commonly served with a slice of lime and salt. Tequila is also used in a variety of cocktails such as the Margarita, the Tequila Sunrise, and the Paloma.